I recently got myself into Circos. It is an amazing tool to visualize data. However, I am a bit lost and I require some help understanding how to proceed. I have RNA-seq data of differentially expressed genes (Log2 fold change) and I would like to plot them on Circos. I would like to have a plot like the following figure if possible. What type of data representation should I choose for Circos plot in order to obtain such representation ? Without wishing to rain on your parade too much, I've never really seen a Circos visualisation that was actually useful. They look good on posters and stuff maybe, but if you're actually trying to show something, consider other alternatives like labelled volcano plots or something. @toralmanvar, I have edited the image. I hope it is showing now. @krushnach80, Yes, I checked the documentation in Circos and I tried to produce a similar plot like the on in the picture but I couldn't find any tutorial to plot similarly to the example mentioned above. @jrj.healey, yes I agree that a Circos plot may not be useful to interpret but when you are working on big data, it is nice to have a plot to see how all your samples behave. hello badredda, but you have not attached the image properly. Please refer this post for adding image to biostar post. Maybe it's obvious to others, but what do the different tracks in the figure represent? e.g. What are the dots, and why are they different colours? What are the peaks? What format is your data in? @ badredda In addition, add some data. 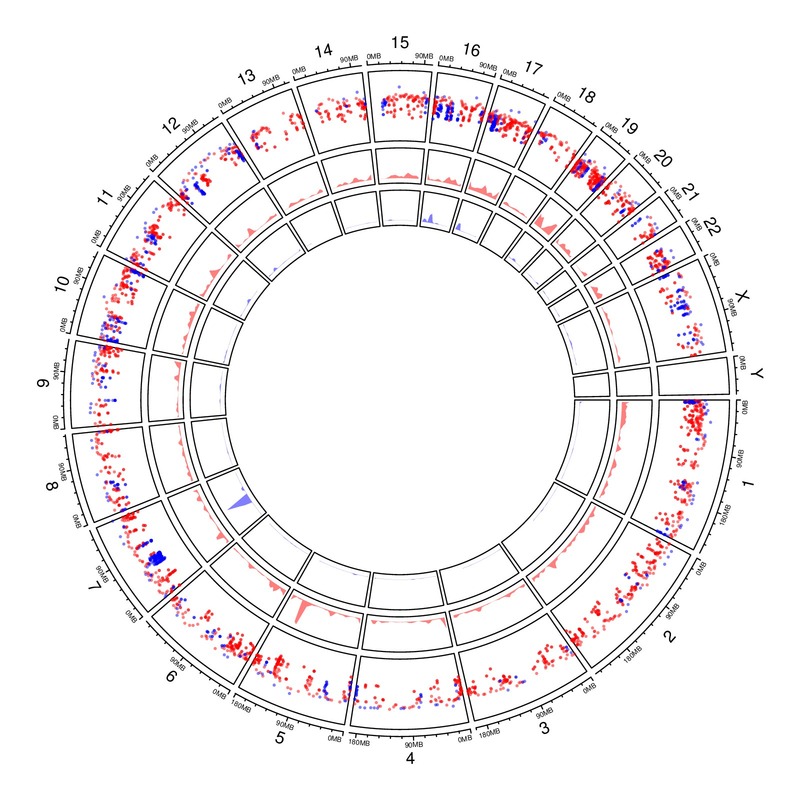 @Russ, In the plot, the first outer-ring shows genes that are over-expressed and under-expressed relative to their position on the circos plot. The inner rings shows the density of the points. You're trying to draw a scatter plot of log2 values of gene expression, correct? Have you looked at this tutorial? It explicitly defines the format your data should be in. To change colours based on criteria (ie over- or under-expressed) you can create rules, explained here. @Russ, thanks for the link, I will check it up and come back later with updates. ## Load cytoband data. Cytoband data downloaded from UCSC for hg38. Please note that further spamming will get your account suspended. ywhzau : Please create a single new post under tool category to describe your application. Posting the same content in multiple threads is not the way to announce a tool you have developed. As @jrj.healey said, circos plot are pretty but they are not always your best bet, specially with lots of data. 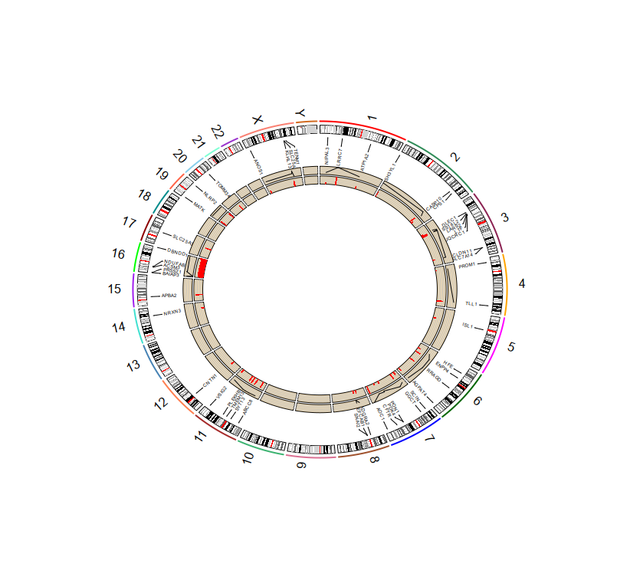 If you want a whole genome view of your data and position on the genome is important to you, you can use karyoploteR to create non-circular genome plots. 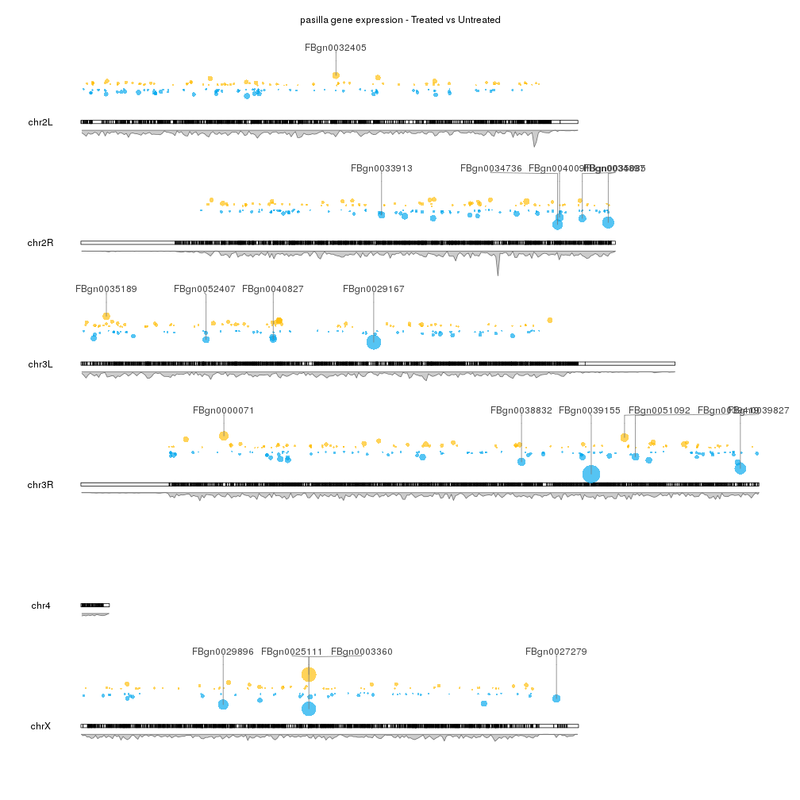 There's a specific example at the karyoploteR examples page on visualizing the results of a differential gene expression analysis that creates a plot like the one below. You can easily zoom-in to specific regions if you need a detailed view. How Can I Visualize Sashimi Plots In Igv Genome Browser ? How to visualize gene difference with PCA? Which program, tool, or strategy do you use to visualize genomic rearrangements? How To Visualize Gene Fusions To Better Illustrate The Gene Structure? Where do I start with Circos plot? best programs for alignment of large whole genomes?